golden state was my favorite team. in fact, i had a lot of favorite teams at the beginning of the playoffs that are no longer in the running. actually, i got every one of my picks wrong. this comes as no surprise if you’ve ever played fantasy football, basketball, baseball, or soccer with me. or if you’ve ever been in the same march madness bracket or the same ncaa football bowl picks game as me. i’m pretty good at not having a clue as to what will happen. but i try. and i keep trying. the point is, it seems like a lot of people are not as interested in the nba finals anymore now that the “more exciting” teams are out. and by all accounts i should be one of them. i rooted for every team that wasn’t one of the final 4. and i rooted for the jazz. so only the jazz are left. but there’s still some sweet basketball to play. the jazz are awesome. i’m even coming around to liking derek fisher. i’ve hated him and made jokes about his fat cheeks for a long time. but it’s not because his baby has cancer or something that i’m coming around. it’s because he’s one of the leading members of the players’ union, and i think that’s nice. the point is, there’s a lot a cool guys on that team. but they’ve got their work cut out for them. the spurs are good. it’s easy to hate the spurs since they have all these old but good players. they get guys like finley and barry to sign small contracts and come off the bench. true, they’re both winding down, but still. then there’s the fact that robert horry is stupid and bruce bowen stupider. but there’s some stuff to like about the spurs. tony p, manu g, and timmy d are all pretty great. mostly tim duncan. my favorite thing about duncan is that he always insists on banking his shots in. he’s incredible at it. i’ve been practicing recently and it’s tough to do. but not impossible. it’s just a matter of always thinking. you have to calculate the angles. you know, law of cosines stuff. i mean, i’m fairly decent at math, but i just can’t get the angles down. so i decided to make a tim duncan cheat sheet. i hope this helps everyone improve their banked jump shots. the diagram below is exactly what is happening in tim duncan’s head when he gets the ball in scoring position. every time. non-stop. all angles, all the time. 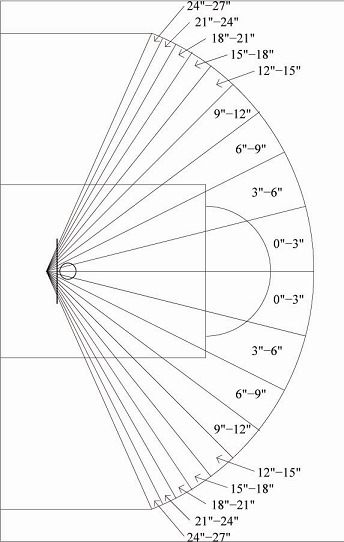 if you’re in one of the slices shown above, the numbers indicate how many inches from the center of the backboard the ball needs to hit in order to “bank it home.” it’s true that there’s some room for other bank shots, but i didn’t draw them because the sectors were getting quite small. but that doesn’t mean duncan doesn’t bank his shots from those tighter angles. first just work on the slices shown. then you can expand your banking ability to those tougher angles. and don’t feel embarrassed to take this diagram with you to the court. if we want to be like duncan, we have to work at it until we get it. just put it on your wristband. like a quarterback arm band. then glance down at your wrist when you’re going to post up to see how many inches away from center you should aim for. after a few months, it’ll become second nature to you and you can get rid of the wristband. you’ll bank without thinking about it. and while i’m on the subject of banking, don’t buy into the idea that you have to always call it. duncan doesn’t call it. he just does it every time. if someone says you have to call it, don’t listen. just keep banking them in. let your bank shots do the talking. i wish tim duncan would let his hair grow out a little bit more. i like it when it’s a couple inches long. This is the greatest thing I’ve read in my life. I’ve been working on my banks on the playground lately (I’m street ball now), and it is difficult when there is no square painted on the backboard. But, that doesn’t stop me. Usually, I miss, but one time that I did make it, somebody said, “Nice, Duncan.” I wanted to say, “No, ‘Nice, Lee,'” because Duncan didn’t invent the bankshot, he’s just the only player who uses it these days. Anyway, I didn’t say that, because I didn’t want it to seem like I can’t take a compliment. Also, I would root for the Spurs against almost anybody if they didn’t have Horry and Bowen. I hate those guys. I also hate Raja Bell because he is Future Bowen. I, for one, am really glad you got that graphics program. Can you help me with my swing? I call bank EVERY TIME my shot his the glass. How else is everyone else going to know I meant to do it?